A science-based program to ensure the safety, security, and effectiveness of the nation’s nuclear stockpile without nuclear testing has proven remarkably successful. Researchers are developing a new technique based on genetic variation in proteins to improve forensic science. Drag-reducing technologies retrofitted to existing semitrucks improve fuel efficiency and support development of a highly aerodynamic tractor–trailer. 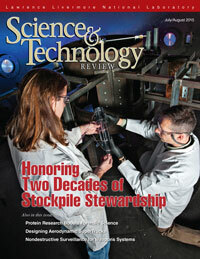 Two decades of stockpile stewardship has led to innovative, nondestructive methods for assessing nuclear weapons systems’ components and materials performance.